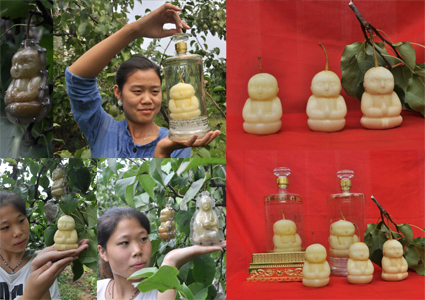 These bizarre Buddha-shaped pears were invented by a farmer in China who is planning to export his novel idea to the UK. Hao Xianzhang has created 10,000 of the mini marvels at his orchard this season and said he plans to take the fruits of his labour to Europe. A woman demonstrates a baby-shaped pear in Handan city, in north China’s Hebei province. Hao spent six years perfecting the intricate baby pears, carefully crafting each one which grows inside an individual mould. Despite their hefty cost of £5 each, locals in his home village of Hexia, in Hebia, northern China, have been snapping them up. Through this idea, you absolutely can create fruit shaped anything!